The Oswegoland Park District provides recreational opportunities for all residents of the Oswegoland community. 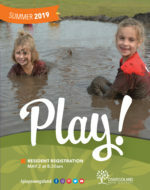 People with and without disabilities are encouraged and invited to register for all Park District programs of interest. People with disabilities will not be discriminated against in the delivery of Park District programs. If you or a family member have special needs and would like to participate in a program, we will make reasonable modifications to meet your needs. Indicate on the registration form if you would like information regarding our inclusion programs and/or specifically identify any need for or request for reasonable modifications according to the Americans with Disabilities Act. View the Evacuation Procedures for People with Disabilities. In compliance with the Americans with Disabilities Act, if you need assistance or special accommodations, please contact the ADA Coordinator, Chad Feldotto, Prairie Point, 313 E. Washington Street, Oswego, IL 60543 or via email at cfeldotto@oswegolandpd.org or phone at 630.554.4428.